When the GRENKELEASING Rapid World Championship will begin as part of the Chess Classic Mainz, World Champion Vishy Anand will try for the eighth time in a row to defend his rapid chess title. All in all he won the main event of the Chess Classic no less than ten times. Harry Schaack talked to the World’s number one about the peculiarities of rapid chess and the opponents he will face this year. 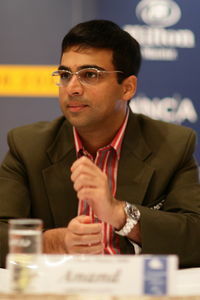 Mr. Anand, for more than ten years you have been the world’s best rapid chess player, which is also shown by your impressive series of ten wins at the Chess Classic. What are the most important qualities necessary for successful rapid chess? Generally, there is no difference whether you play short or long games. If you play well, you usually play well in both disciplines. The difference lies in the way you have to focus. In rapid chess you have to give everything in 30 minutes whereas you can allow yourself a 10 or 20 minute break in a 7 hour game. Another difference is that you have to react very quickly when confronted with an opening novelty. This year Aronian came up with a spectacular novelty against Leko at the tournament in Morelia and Leko thought one and a half hours about his reply – the amount of time you do have in three rapid games. With 30 minutes on the clock you have to be able to react very quickly. Apart from that, it’s simply important to play a good move (laughs). I like rapid chess because I find it easier to focus only for half an hour. And I think this way of playing chess is also very attractive to the public. What about psychology? I would guess it’s psychologically particularly demanding, because you need to overcome defeats very quickly? Yes, playing three games per evening means three periods of enormous emotional pressure. You have to learn to cope with the emotional ups and downs and to forget losses quickly. However, in contrast to a long game in rapid chess you do have the chance to straighten things out immediately by winning the next game. What do you expect from this year’s GRENKELEASING Rapid World Championship? I look really forward to play rapid chess in Mainz, because my results have not been particularly good this year. Yes, this tournament was simply a disaster. I can’t remember ever having had such a bad result. But in the other tournaments, too, something was amiss. 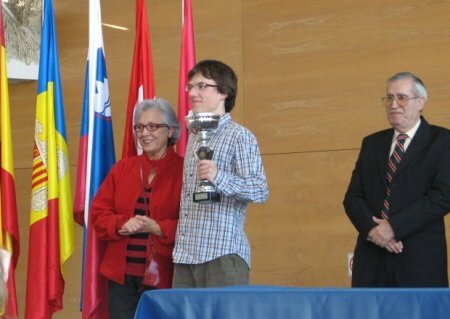 In Leon I had to fight a lot against Paco Vallejo and in the final against Ivanchuk I neither played particularly well. I hope things will run more smoothly in Mainz. You do want to regain some lost ground at the Chess Classic? Yes, during the last years I have won Leon three times and I have won the Rapid Chess Tournament at the Melody Amber four times in a row. But this year, things have not been going too well. I do have this in mind and I know that I have to work hard to be successful. All my opponents in Mainz are in excellent shape and have achieved a number of outstanding results in the last months. Both Carlsen and Morozevich have had a convincing and impressive year. And Judit Polgar is always dangerous. She takes to rapid chess like a fish to water. This is an excellent field and I think this year it will be harder than ever to defend my title. How do you feel about the Chess Classic? Is the familiar atmosphere important for you? There are tournaments, which I have played so often at a certain time of the year that I cannot remember ever to have done anything different at that time. In August I usually have been in Mainz and in January I am always at the tournament in Wijk aan Zee. In 2002 I did not play in Wijk and asked myself: So, what do you do with your spare time in January now? (laughs). Of course, you get used to these regular tournaments. However, each year you have to think about them anew. It would be fatal to believe things will run on their own. But of course I know exactly what I do in Mainz. Everyday I take a walk along the Rhine, I do have my favorite restaurants and I know what I will do before the game. As far as that is concerned, there are hardly any surprises anymore. Do you feel pressure because of the success you have been enjoying at the Chess Classic for such a long time now? I try not to think too much about this. Now I can say that I have been winning eight times in a row. But each year the tournament is a new experience in “surviving” (laughs). Every time I manage to better my own record I am happy. Of course, I hope that my series will still continue for a while. In October you will defend your title of World Champion against Vladimir Kramnik. Since months you have been preparing for this event. Could you focus on the Chess Classic as well as in the years before? Last year, I neither could prepare particularly thoroughly for Mainz because of the World Championship in Mexico. But these four player tournaments are easier to play. If you have to play a match as you had once had to at the Chess Classic you have to work much more to prepare. At a tournament you prepare in a much more general way and you do not have to go to that deep in your analysis. However, in rapid chess it is first of all important to play well. You have to have a clear head at the board and you have to be fresh. In rapid chess your performance depends on your play at the board not on your preparation. This is difficult to control. You have to focus to be able to react quickly and alertly – even more so than in classical chess. That is the most important. This year you will face the new „Bobby Fischer“: the Norwegian Magnus Carlsen. He might even be better than the American with 17. Do you see parallels between the two? That is difficult to say because I know Carlsen personally and regularly play against him. Though I met Bobby Fischer once, I have never played against him – it is just not the same. He stopped playing 1972. However, you can say that both have a simple way to play, both are “classical” players. They do not strive for complications, but choose moves which later are easy to understand. That’s what I mean with “classical”, a kind of style one can also find in the games of Capablanca. Carlsen and Fischer are both brilliant in simple technical positions. This year, Magnus has often won positions, in which he had only a small or even no advantage at all. Actually, usually you need to be older for such a mature style. Carlsen actually does not yet have the experience to play this way. It is a bit surprising to see that he is already that far with 17 years of age. That is very impressive. You could say that both Fischer and Carlsen had or have the ability to let chess look simple. People eagerly await the battle between you and Magnus Carlsen in Mainz. On the virtual world’s ranking list he might even get ahead of you should he do well in Biel. You are the only top player who still clearly dominates him. You have never lost a long game against him. That’s true, but I don’t want to talk much about that because I hope this will last for a long time (laughs). Carlsen develops very quickly. The Magnus from August is no longer the one from January. What do you think about Carlsen’s skill in rapid chess? Carlsen belongs to the generation of players who often play blitz on the internet. You don’t have to explain Magnus, why rapid or blitz chess is interesting. For him this is quite natural, he grew up with it. This is something the great players of the past could not do. These young players do have a different perspective on these things. Carlsen, too, belongs to this „computer generation“. This is particularly apparent if you remember that the computer program „Fritz“ is older than Carlsen. Today, everybody is used to playing rapid chess. Currently Alexander Morozevich is number 2 – behind you – on the official FIDE ranking list. He again and again achieves excellent results, but in top tournaments he occasionally performs not as good as one would expect. Is this due to his style, which does not work against the top players or is this a psychological problem? I don’t know. I play at least twice a year against him at the Melody Amber and there he is really very dangerous. It is not for nothing that he often won the overall competition – blindfold chess and rapid chess together. How would you characterize his style? His way of playing is something special and of course not as classical as Carlsen’s (laughs). He plays very, very creatively and extremely aggressively. He tries to disturb the balance on the board no matter what it takes. This exerts an enormous pressure on his opponents. This style is very difficult to emulate. In his way to play chess Morozevich is unique. Does he not also play with enormous risks because he wants to win at all costs? Maybe, but I believe he does not think that he takes a lot of risks. The positions he reaches are very unusual for us but not unusual for him. In hair-rising complications he feels as much as home as Ulf Andersson in an equal endgame. His way to understand chess is clearly different from most other top players. However, it is obvious that someone who again and again managed to climb to the top of the world’s ranking list is simply a top player – no more and no less. Currently he is one of the outstanding players of the world. In 2003 you played quite an intense match against Judit Polgar at the Chess Classic. All games were decided. Your games against Judit are marked by remarkable aggressiveness: 70% of the games had a winner, which is rather unusual on your level. Even the draws, such as the one in Wijk aan Zee 2003 are fought with utmost sharpness. Indeed, to play with Judit is really something special. In a rapid chess match in Parla, in which I won 4:2, we neither had one single draw. Judit is particularly good in tactical positions. Of course, she also has a good positional understanding, but it is in tactical positions that she is able to display her most marked strengths. She has a very good feeling for these tactical positions. One reason for the few draws between us is certainly the choice of openings. We both like the Sicilian, and thus we often reach this kind of tactical positions. And our overall result is really strange. I think, with no other player from the world’s top I have played such a small number of draws. Yes, I think, this year it’s going to be very interesting. I think, it might well be one of the most exciting events of the Chess Classic. Humpy Koneru managed to win Pia Cramling in the third round and thus to go up the last line of the tournament table. She told why she always travels with her father, what is the emblem sewed on her blouse and why she likes Russian climate. Was it difficult for you to collect yourself after two defeats and to win? Humpy Koneru: It was a difficult game because I made mistakes in time trouble. But then I managed to pull me up. Concerning defeats it is the first time in my career when I lose two games one after another in the women tournament. You do not often take part in women competitions. Why? I often play in open tournaments and prefer playing with men because I do it better. But it happens not because there is a difference between play with men and women. It just happens so. I am going to take part in the World Women Championship that will begin at the end of August in Nalchik. So I will come to Russia again. How do you feel in Krasnoturinsk? It is my second time here and I like it very much. The climate is super. But it has been raining for the second day. Yes, I prefer cool weather. It is always too hot in India. Would you like to visit Russia in winter? 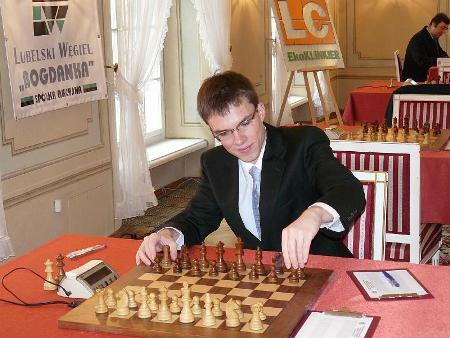 I played in the world championship in March in Russia. It was still snowing. And it was a very interesting experience for me. You have an interesting emblem on your blouse. What is it? It is the emblem of the national gas corporation that is my sponsor already more than one year and a half. Your father accompanies you here. Do you always travel together? My father taught me to play chess and he is still my coach. That’s why we are always together. How will you spend your day-off? I didn’t think about it. But I heard that the organizers prepared something interesting for us. Interview by WIM Anna Burtasova after round 1 of North Urals Cup. 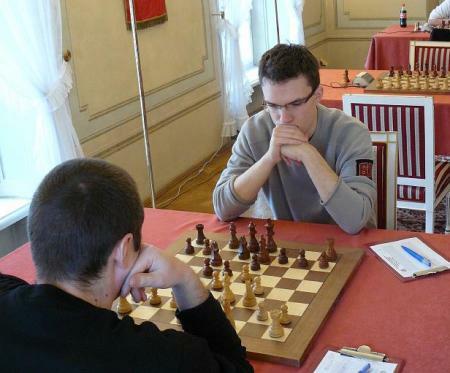 - Vladimir today Antoaneta played black with the rating-leader of the tournament. What instructions did you give before the match? V.: Antoaneta plays all matches with the intention to win and it doesn’t matter whether she plays white or black and no matter with whom she plays. The same was with this match. - But after the drawing procedure during the opening ceremony it seemed that Antoaneta was not so satisfied that she had to play black one more match when she got the 6th number. V.: Yes, of course she was a bit upset. However to play black is a little more difficult. But I can say that in my opinion she plays black even better than white. Today’s match confirmed it. - Did she manage to use the prepared variant in this match? V.: We examined the variant that happened in the match. But the great attention we paid to variants that appeared in games of the Indian player more often. That is why we can say that it was she who surprised us in the opening. But later she lost assurance and began to think too long. Most likely she chose this position because there is one match in which white won confidently. But Antoaneta doesn’t have to play the same way. - Vladimir, is it so difficult to be the coach of women? В.: To be the coach is not so easy. The most important is trust and mutual understanding. It is exactly what we have with Antoaneta. Even if I give her some instructions just before the game she will follow it. In general I think that there are not so many talented coaches in the world. Chess players of post soviet countries have some advantage; there are more serious specialists here. - Do you train somebody apart from Stefanova? V.: I worked as a coach in America. But at that time Antoaneta lost 100 points of her rating. I decided to come back to Europe and now I train only her. She managed to get the rating back and I think we will have the success. We will go together to the World Championship that starts in August in Nalchik. - Antoaneta has the active style of chess playing. What is your opinion as a coach is there any connection between the person’s character and way of chess playing? V.: It seems to me that there is a connection here. Active chess player has also active way of life. And who prefers quiet life without risks plays chess the same way. 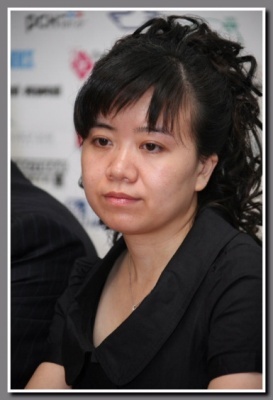 In 2006 Xu Yuhua, Grandmaster from China, became an all-round female world champion. She was leading a confident struggle during the tournament, and, as a result, did not leave any chances to the opponents, having beaten Russian Alisa Galiamova. Now Xu Yuhua is ready join the battle for the North Urals Cup. - This is not your first visit to the Urals. What are your impressions of the region? - I like it very much here. I’ve been to Yekaterinburg, and it is my second visit to Krasnoturinsk. The people here are very friendly. They radiate warmth and kindness. I was very glad to see the people that I’ve already met among the organizers. - In 2006 you became the world chess champion among women. What were your impression of the victory? - I was very happy and proud of my country and people. It was one of the best moments in my life. At that time I was going to become a mother, and the victory at the Championship made me twice happier. But the time is passing by. And the sky is the limit. I should move only forward. - In which large competitions did you take part after the World Championship? - In 2007 I took part in the European Club Championship held in Turkey. I played for the Russia club AVS that became a runner-up. I enjoyed playing for this club very much. I have good relations with my team mates and coaches. This year at the Russian Club Championship I played for another Russian club Spartak, Vidnoe. We also became runners-up but we should have become the champions. It was my fault. I lost in a crucial game. But I hope that in the future I will improve. - Share your feeling expecting the Women’s World Chess Championship in Nalchik this August. How do you evaluate your chances to win? - I am not in the position to make predictions. I’d like only to say that I will try to do my best and show my best chess but I don’t know what the outcome will be. A lot has changed during the last two years. I have become a mother. During a year I was taking care of my son and family. But now I am coming back to chess. - In one of the interviews you mentioned that Anand is your idol in chess. 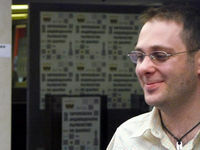 Do you have any idols among Russian chess players? - Among Russian chess players I like the play of Alexander Morozevich. He has a lot of interesting and exciting matches. Among women I’d like to mention Alexandra Kosteniuk. In 2001 I played her in a semi-final of the World Championship. She is a very strong player. I know that she is in a similar position. After birth of her child she is gradually coming back to chess. In general, intelligence, excellent tactics and persistence are characteristic features of Russian chess players. - This November the Chess Olympiad will be held in Dresden. Are you going to participate in it? - I am not sure that I’ll go there. The time will show. But in general, regardless of the fact whether I will take part in it or not, the Chinese team has very good chances to win. - In 2005 you already took part in the tournament “North Urals Cup”. Describe your impressions of that tournament. - I enjoyed the competition very much. Last year I was taking care of my little son, and it prevented me from visiting your hospitable town. That is why I was very happy to get an opportunity to come here again. - And the last thing, please share with your fans what we can expect of the tournament “North Urals Cup 2008″? - It is impossible to predict the course of events. I think the players will play interesting and tense chess. As for me, I will try to play excellent chess, and make my fans happy.